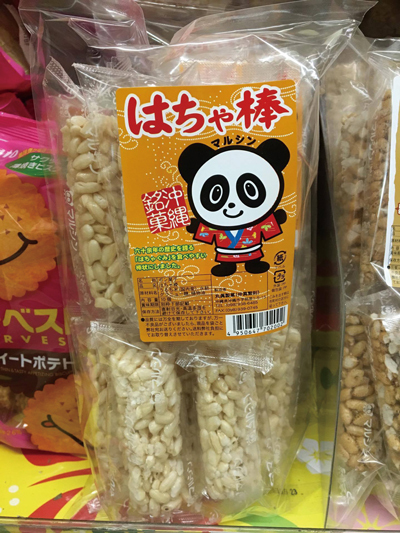 Hachagumi is an Okinawan snack first made about 60 years ago. This snack is made of rice, brown sugar, sugar, and starch syrup by mixing roasted rice mix with melted sugar and starch syrup. Okinawan dialect “Hacha” means “enlivened” and “gumi” means “rice.” The sweets are round in shape and taste a bit like a sticky cereal bar. Hachagumi used to be popular among kids during the first part of the last century, and people sold on streets outside food stores. A special tool was used to make it in front of children. Okiko Co.ltd., a maker of bread, Okinawa soba noodles, and snacks still makes hachagumi. Everyone on Okinawa knows this company because they have made Okinawan foods since 1947. One of their products was “Hacha-stick” that is easier to eat than traditional hachagumi because of its shape. Hachagumi is still sold at grocery shops and convenience stores.